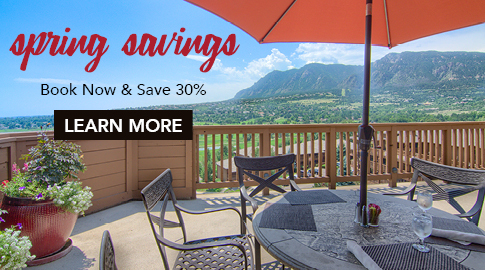 Located in Colorado Springs, Cheyenne Mountain Resort is the perfect launchpad for your next adventure. Whether you’re a hiker or a homebody, Colorado’s sure to leave an impression you won’t forget. There’s wonder beyond our walls — go out there and find it. Commune with the divine. Walk among impossible sandstone formations and explore to your heart’s content. Tackle Colorado’s beloved 14’er. Hike, bike, or drive your way to the summit, and take in the sight of the countryside from 14,110 feet. Take your family on a subterranean adventure they won’t soon forget. A pair of guided tour options are available, snaking through an interconnected network of stalactite- and stalagmite-lined rooms. Experience a piece of Colorado history 955 feet above the Arkansas River. America’s tallest suspension bridge and zipline is only an hour away. Ranked among the best zoos in the country by USA Today and America's only mountain zoo, Cheyenne Mountain Zoo spans 140 acres and features more than 750 animals across varied terrain, as well as fun Mountaineer Sky Ride over the Rocky Mountain goats and grizzly bears. An excursion for the trendy and the artsy alike. Get mountain views and downtown vibes, just six miles west of Colorado Springs. Admire the ingenuity of the Anasazi civilization. Roam through 800-year-old sandstone dwellings, re-built at the foot of Pike’s Peak. Live like a local. Visit the West Side neighborhood’s weekly Farmer’s Market, stroll down the First Friday ArtWalk, and sample goods from local shops. Connect with the past in this historic mining town. Test your luck in a casino, tour a functional gold mine, and peer into the life of a 19th-century prospector. Experience the history and get a taste of cadet life with a tour of the official Air Force Academy, where cadets are developed into leaders for our Air Force and nation. Show your support for Team USA and tour the headquarters of the U.S. Olympic Committee. Be sure to explore the U.S. Olympic Hall of Fame Rotunda.